These are the handiest little grab and go breakfast. They’re crunchy and chewy and everything you crave when you need a boost of energy. 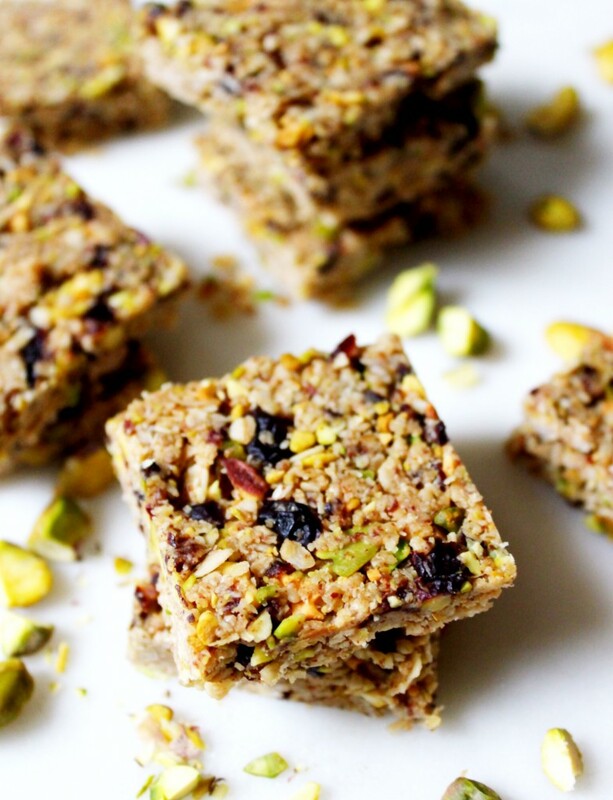 The oats and pistachios are roasted for extra flavour and everything’s held together with an irresistible sticky mixture of almond butter, coconut oil and maple syrup. If you’re not grabbing these as you head out the door, try them crumbled over some warm almond milk for a yummy warming snack. 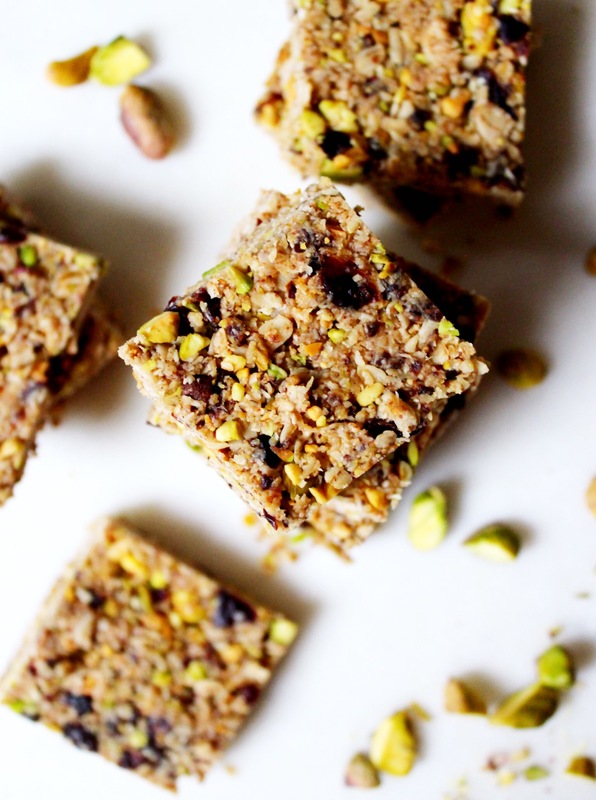 Roughly chop the pistachios and add them to a baking sheet with the gluten free oats. Bake them at 180’C for about 8 minutes until lightly toasted, tossing once in the middle. While they’re cooking, roughly chop the dried cranberries and then add them to your food processor with the desiccated coconut but don’t blend yet. When they’re ready, add in the toasted pistachios and oats too. Add the coconut oil, almond butter, maple syrup and salt to a small saucepan on medium heat and stir. When the mixture is completely melted, add it to the food processor and blend until you have a crumbly paste. Press the mixture tightly into a small baking tin lined with parchment paper. Pop it in the fridge for about an hour to set. Slice into squares and serve. You had me at almond butter! Can’t wait to try these – the perfect busy-morning breakfast treat! I made these last night and had it with my coffee this morning. Way better than my usual bagel and cream cheese. Thank you. Outstanding, thank you! Exactly what I’ve been looking for. Do you have nutritional information? Also, can the recipe be multiplied without adjustments in proportion? I don’t have nutritional info for my recipes at the moment but this one can be multiplied in proportion as much as you like! Enjoy!